Today we released an update for FontDoctor for Macintosh and Windows. 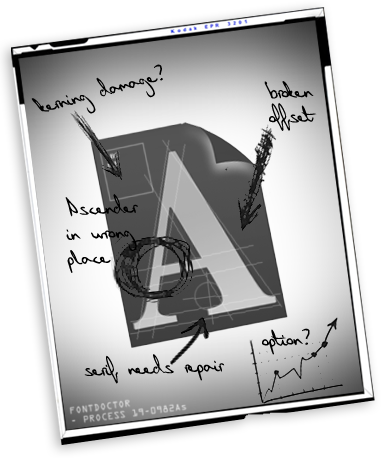 FontDoctor has long been the industry standard for font problem diagnosis, repair, and organization. FontDoctor will locate and eliminate hard-to-find font problems that wreak havoc on operating system performance and applications. FontDoctor will scan font folders (on local hard drives or over a network) to locate and repair common font illnesses, including corrupt or damaged fonts, missing Postscript fonts, missing bitmaps, and lots more. FontDoctor will also organize your font files into a new clean font library, and can generate diagnosis and organization reports and charts as needed. * FontDoctor supports TrueType, PostScript Type 1, PostScript Type 3, Multiple Master fonts (Mac version only), OpenType fonts, DataFork fonts (Mac version only), and bitmap fonts. FontGear Inc. is a leading professional software development company for Macintosh and Windows, specializing in font application tools for graphics professionals and the printing industry. FontGear Inc. is located in Charlotte, North Carolina.